Planning to hit your favorite trails on the snowmobile this weekend? Us too! After all, Utah is home to some of the best snow on earth, and it’s the perfect place to enjoy some outdoor fun. This is by no means an all-inclusive list, but covers the essentials for snowmobile safety. .
No one wants to be caught in an avalanche. With the rise of smartphones and online communities, checking conditions is easier than ever. For easy and instant access, download an avalanche app such as the Utah Avalanche Center (iOS only) or Avalanche Forecasts (iOS and Android). These apps provide information on avalanche warnings, weather, roads, and slope angles. Once you’ve made sure the weather is ideal and the avalanche conditions are solid, it’s time to plan out your route. Utah has snowmobile trails across the state, and many of them can be found by using our interactive maps. Always be sure to check the grooming reports for your area as well. After all, no one wants to get stuck out in the snow. For a full list of OHV maps and trails, visit the OHV maps section of the Utah State Parks website. While no one plans to get stuck under feet of snow, it is never a bad idea to plan ahead on what to do if you are caught in an avalanche— or come across another rider who has been. Some important items to keep in your pack include a snow probe, an avalanche beacon, and a shovel. Snow probes are used by rescuers to probe around under snow in order to locate someone who has been trapped after an avalanche. 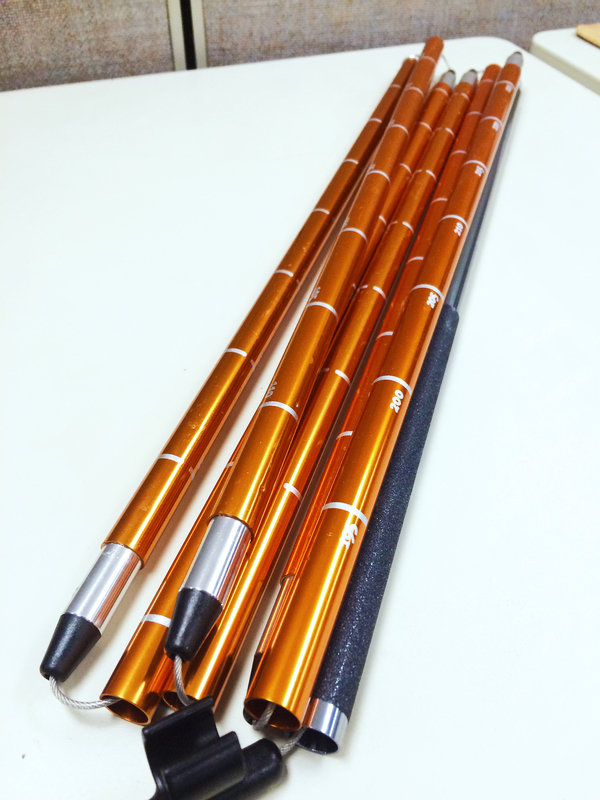 They resemble collapsible tent poles and have markings on them used to measure the depth of the snow. An avalanche beacon is another item used by rescuers to help locate people trapped under the snow. These can also be used to transmit a signal to other beacons, allowing you to send out an emergency signal if you get trapped. Always make sure you have a shovel. 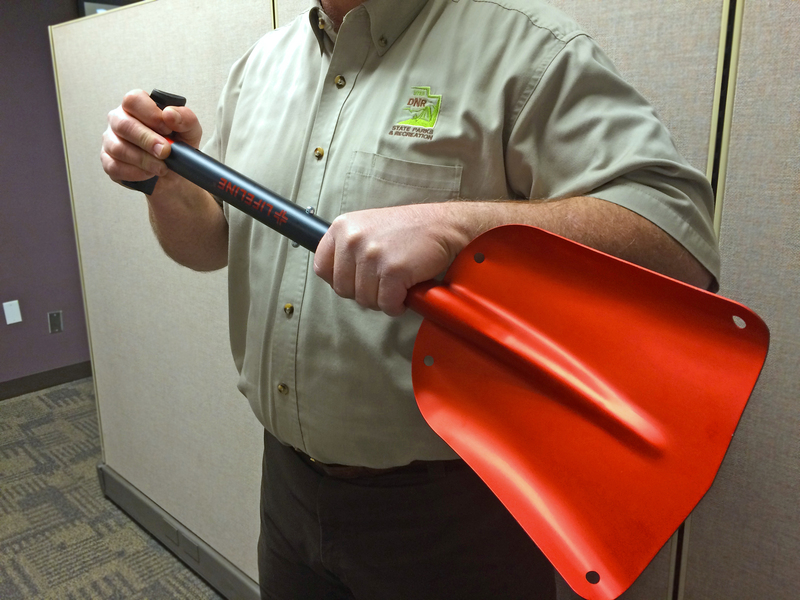 There are light, collapsible shovels made specifically for people recreating in potential avalanche conditions. Whatever shovel you choose doesn’t have to be big and bulky, but it should be large and strong enough to get the job done. Whether you are digging out a stuck snowmobile or getting to a buried rider, the trusty shovel is always a good item to have on-hand. To ensure you have the most enjoyable time possible while in the snow, it’s important to dress for the weather. Dressing in layers is one key way to stay safe and comfortable while riding in the falling snow and cold winds. Remember, if you have too many layers on, you can always remove some. Base layers should be lightweight and have the ability to dry quickly. For your outer layer, we recommend a snowmobile suit. There are many different kinds of snowmobile suits made specifically for time on the trails. These suits protect from wind, snow, and rain, and are often waterproof. Some models also come equipped with flotation devices, just in case you fall through a sheet of ice. Don’t forget your facemasks, gloves, socks, boots, and goggles. Anyone who has spent time with Boy Scouts knows the motto “Be prepared!” the same goes for snowmobiling. 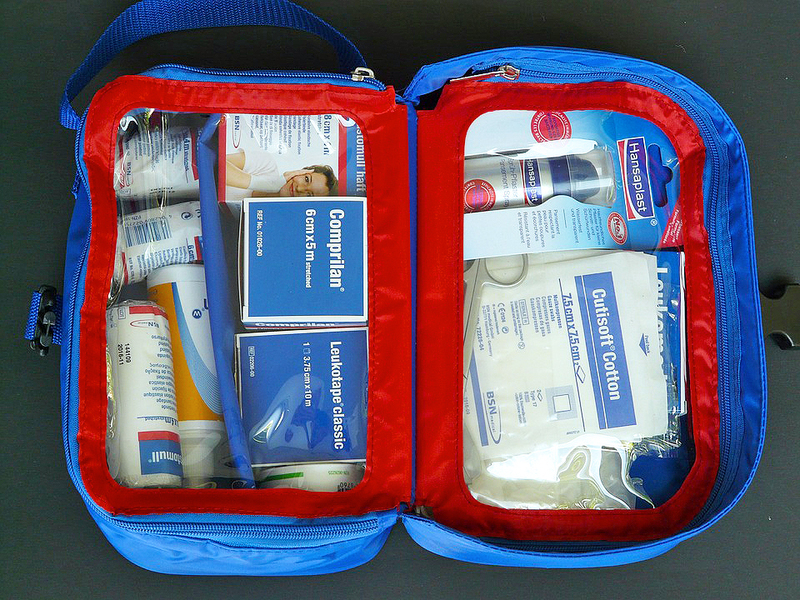 Emergency kits come in many shapes and sizes, so there are many options to meet your exact needs. Remember, it’s better to have one of these kits with you and not need it than need it and not have one. Some basic essentials for your kit include: an emergency whistle, a reflective blanket, water, high-energy foods like granola or meal bars, and a basic first-aid kit. Heading out for some fine time in the mountains? Bring a friend with you! Not only does this allow for some quality bonding time away from the hustle and bustle of everyday life, but it also helps you safeguard against dangers. Should you get stuck, have a wreck, or worse, riding with a friend helps you get off the mountain or get help to you quickly. Often times, lost or trapped snowmobilers could have been found and rescued much sooner if someone off the mountain were aware something was wrong. Letting a friend, co-worker, or family member know where you are going and when you should return allows search and rescue personnel an idea of your location, should the situation go south. Keep your off-mountain contact updated. If snow conditions in your area change and you alter your plans, give your friend a quick call and let them know the new plan. Just because the temperature is low doesn’t mean it’s time to put the sunscreen away with the bathing suits and beach towels. 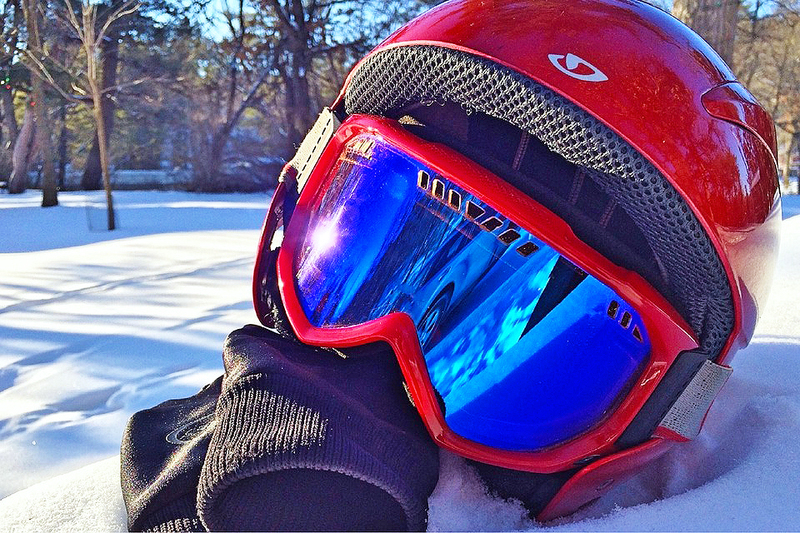 In fact, 80 percent of UV radiation is reflected back up at you from snow, while sand only reflects 20 percent. Add in Utah’s higher altitude and sunscreen really starts to sound like a smart idea. Don’t forget to reapply the sunscreen throughout the trip. Use one with at least an SPF 30 rating. Moisturizers added to the sunscreen may also help keep your skin from becoming dry and damaged from the wind and cold. Helmets are a must for anyone riding a snowmobile. Helmets are critical when ensuring rider safety, and should be worn at all times when riding a snowmobile. Not only do they keep you safe should the snowmobile crash, but they also add another layer to help keep your body warm. Whenever possible, it’s best to wear a full-face helmet because it helps protect your face and eyes (along with your goggles) from the wind and cold, while also guarding your face against direct impact. Once you’ve taken the proper precautions, the most important thing to remember is to have fun while on your snowmobile! 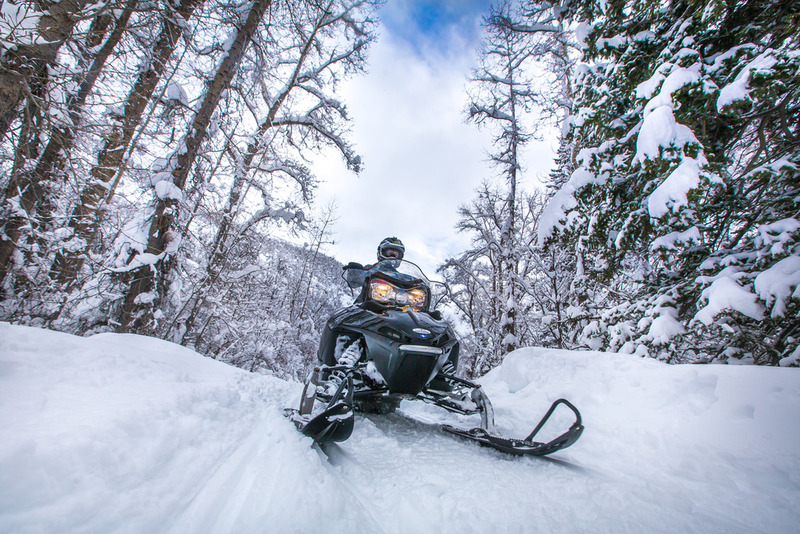 The sense of freedom and adventure the trails provide is hard to beat, and with snowmobile popularity on the rise, things are only looking up from here. For any questions about snowmobile maps, laws, or other matters, visit our OHV website, or give us a call at 1-801-538-RIDE. Utah’s snow is perfect for outdoor adventures.